Knowing how to submit an offer on a condo or coop in NYC is almost as important as knowing that you can save thousands on your purchase price with a broker commission rebate. In this article, we explain how you can prepare and submit an offer on a property in NYC. What Should I Do Before Submitting an Offer in NYC? Why Should I Work with a Buyer’s Agent in New York City? How Do I Submit an Offer on a Property in NYC? What Information Do I Need to Submit with My Offer? What Does the REBNY Submit Offer Form Look Like? 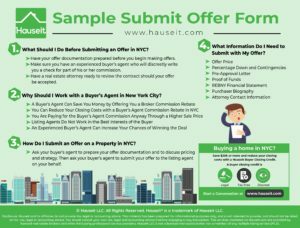 Because of the limited inventory of properties available in NYC and high competition among buyers, a savvy home buyer must be prepared to submit an offer on a moment’s notice. Therefore, it’s critical that you have your offer documentation prepared before you begin searching for a property. Ideally, you’ll also want to have identified a real estate attorney to work with before you begin the process of submitting offers. The importance of being prepared in the hyper-competitive market of New York City real estate cannot be underestimated. Many inexperienced buyers begin searching for properties without having any idea how to submit an offer in NYC. They won’t have a buyer agent rebate lined up nor will they even know whether real estate offers are binding in NYC. When these sorts of buyers eventually find the perfect property, it takes them so long to figure out how the offer process works and prepare the offer documentation that they ultimately lose out on the property to a faster buyer. Later in this article we will discuss the specific items you need to prepare in order to submit an offer on a property here in NYC. We’ve already explained how due to NYC’s unique commission structure for buyers, the services of a buyer’s agent in New York City are free for buyers. But what if on top of all the benefits of having a buyer’s agent, you could actually be paid to work with one? 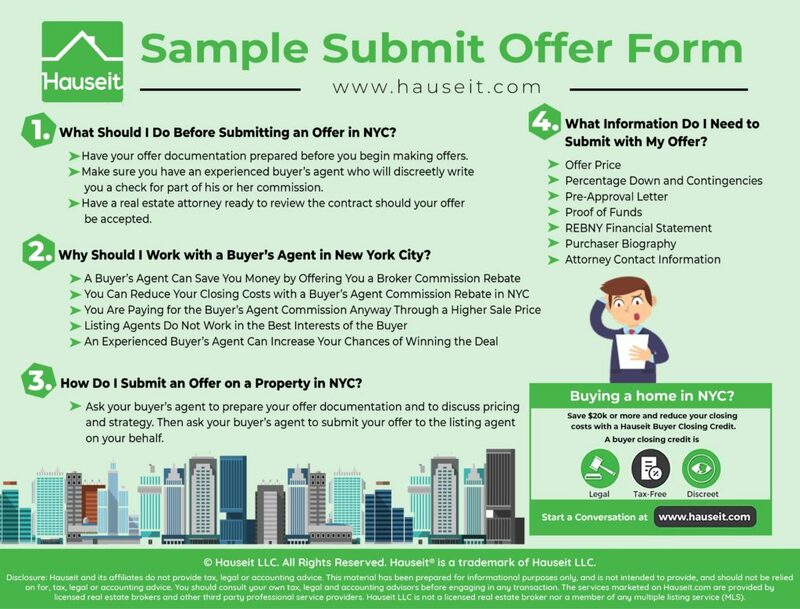 By working with a Hauseit affiliated buyer’s agent, home buyers in NYC actually get paid a closing gift from their buyer agent’s fee post closing. The broker commission rebate offered to our clients often end up being $20,000 or more because of how high the median resale price is here in NYC. As a buyer, you can view the commission rebate as a discreet way to lower your purchase price, reduce closing costs or as a strategy for allowing you to bid more competitively on a property knowing you’ll receive a substantial amount of free post closing equity. Closing costs for buyers in NYC are not something to be taken lightly. In the case of condos, buyer closing costs can add over 3% to your purchase price. Closing costs for new construction are even higher because buyers must also pay the additional NYC and NY property transfer taxes of 1.4% to 1.825%. 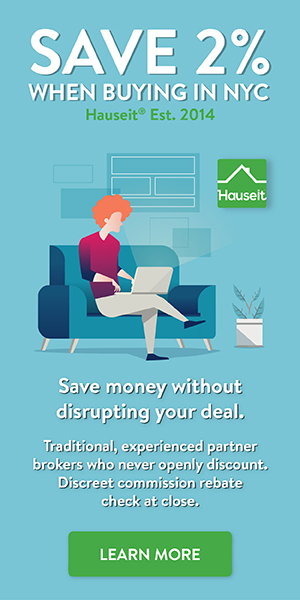 One of the easiest ways to reduce your buyer closing costs in NYC without risking your deal with a shady mom and pop rebate broker is to request a NYC broker commission rebate through Hauseit. NYC home buyers who request a buyer’s agent commission rebate can fully eliminate the 1% NYC mansion tax closing cost. NYC broker commission rebates are not taxable, and as a result you can save a tremendous amount of money on your NYC apartment purchase by requesting one. Due to the way commissions are structured in New York City, sellers have usually agreed to pay the full 6% commission regardless of whether the buyer is represented or unrepresented. If the buyer is unrepresented, the full 6% commission goes to the listing agent. If the buyer is represented, the commission is split equally between the listing agent and the buyer’s agent. In other words, home buyers in NYC are already paying for buy side representation through a higher sale price. Many uninformed buyers step directly into negotiations with a listing agent without realizing that a listing agent may not represent the best interests of buyers. The reality is that a listing agent typically works only in the best interests of the seller. Therefore, there are some serious risks in working directly with a listing agent when negotiating. For example, let’s say you are an unrepresented buyer and you tell this to a listing agent: “I can pay up to $600k, but let’s start with an initial offer of $550k.” While you may be thinking that the agent will simply submit the offer of $550k to the seller, the reality is that the listing agent is legally obligated to tell the seller that you are willing to pay up to $600k. As you can see, it’s somewhat hard to negotiate with a seller through an intermediary whose loyalty is only to the seller. Because of the dangers for unrepresented buyers, New York State requires all Licensed Real Estate Salespeople, Brokers or Associate Brokers to present an Agency Disclosure Form to everyone they work with. In the example above, the disclosure would have clarified to the buyer that the listing agent was working in the interests of the seller. Having a buyer’s agent can be highly beneficial in a negotiation because it allows you to negotiate through a highly experienced intermediary who is working exclusively in your best interests as a buyer. You can avoid the dangers of dual agency in NYC by having dedicated buy side representation. A buyer’s agent is someone you can trust throughout the purchase process. Because of New York City’s limited inventory, many buyers have a limited selection of listings that fit their criteria. Therefore, when the perfect listing comes onto the market there is tremendous competition. One of our 1% full service listings on the Upper West Side recently received over 10 offers and sold for 10% more than asking price. When there is fierce competition, the buyers that have the best chance of winning are usually represented. That’s because an experienced buyer’s agent knows how to stay in front of a busy listing agent and get real time updates before every other buyer. This allows the represented buyer to strategize and move more quickly than other parties. In addition, most if not all listing agents actually enjoy having an experienced buyer’s agent on the other side of the deal. This is because an experienced buyer’s agent acts as an additional driving force for getting a deal done quickly. In a typical deal, the buyer’s agent responsibilities range from preparing and submitting the co-op board application to educating the buyer, setting expectations and helping to facilitate the overall closing process which may include the appraisal, home inspection and/or walk-through. Furthermore, a veteran buyer’s broker will be absolutely necessary if the buyer wants to attempt more complicated maneuvers like a purchase CEMA mortgage to save on the mortgage recording tax or a 1031 tax deferred exchange to save on capital gains taxes. A listing agent will appreciate a seasoned buyer’s broker on the other side even if the buyer is just buying a coop in NYC due to the additional complexity involved versus buying a condo in NYC. Buyer agent commission rebates in NYC are completely legal, so you’d think that every buyer would have heard of them by now. The reality is quite the opposite. Virtually all traditional buyer’s agents won’t ever offer the rebate or even acknowledge that the practice exists. The sad truth is that these brokers are too used to keeping the full 3% buyer agent commission and just sending their clients a $50 box of chocolates at closing instead of a $20,000 or more commission rebate check! As a seller, you will want to make sure any offer submitted is credible and serious so you don’t waste your time and valuable momentum with an unqualified buyer. As a buyer, don’t expect to get away with just sending an email with the offer amount and a pre-qualification letter. Submitting an offer is actually a straightforward process provided that you’ve prepared all of your offer documentation in advance. If you’re working with a great buyer’s agent, he or she will professionally present the offer on your behalf to the listing agent. If you have signed up to receive a buyer agent commission rebate, it is extremely important that you allow your buyer’s agent to submit your offer on your behalf. Otherwise, the listing agent will have reason to say that your buyer’s agent was not the “procuring cause of the sale” and may have grounds to deny co-broking, or sharing commission with your buyer’s agent. Depending on how lenient or strict the listing agent is, you may need to present some of this information on an ‘offer submission form’ while also attaching the relevant documentation from the list above. Prior to submitting an offer, you’ll want to think about your offer level (i.e. price) by conducting a thorough analysis of recently closed deals and competing listings in the building and/or area. Buyers who are working with a buyer’s agent can receive a sanity check on the listing’s price and the buyer’s anticipated offer level. Buyer’s agents add value during this process by contacting the listing agent and working to extract as much information as possible about the listing’s history on the market: current offers, previous offers, seller reserve prices, etc. By synthesizing comps, the information provided by the listing agent, as well as the level of interest you as the buyer have in the property, a good real estate buyer’s agent is able to give you his/her professional opinion on what offer price you should initially submit. If you are financing the purchase, you’ll also need to indicate in your offer what percentage you plan on financing. In NYC, virtually all coops require that buyers put down at least 20%. Before submitting an offer, you or your buyer’s agent should confirm with the seller’s agent exactly what the building requires. Condos often have more flexibility and in general permit up to 90% financing, but each building is unique and it’s worth checking. Most coops will also have targets for a buyer’s post closing liquidity and other typical co op financial requirements. What this means is that a coop may require that a buyer have 1-3 years of monthly maintenance and loan payments in liquid assets after accounting for a down payment and all closing costs. So when you are considering your down payment percentage, it’s important you keep in mind any post-closing liquidity requirements for your building. Will my offer be more competitive if I put down a greater percentage? When an offer is contingent on financing, it means that the deal will only go through if the purchaser is able to secure a mortgage. Another common contingency is one which makes the deal dependent on the purchaser being able to sell another unit first. Therefore, all cash and non-contingent financed offers offer the seller the greatest assurance that a deal will go through. Because of the potential for a quick close and the lack of a contingency, all cash buyers often have compelling negotiating power at the deal table. If you are a serious home buyer who will be financing the purchase, you’ll need to include a pre-approval letter from a reputable bank along with your offer. If you are hesitant to request a pre-approval letter from your mortgage broker or bank because you want to avoid a hard credit pull, it may be okay to submit a pre-qualification letter with your offer. Pre-qualification letters can be requested in as little as a few hours, and they normally only require a soft credit pull which does not impact your credit score. If you decide to submit just a pre-qualification letter with your offer, simply note in your offer letter that you plan on sending a full pre-approval letter as soon as possible. However, keep in mind that listing brokers are quite aware that your lender has not thoroughly vetted you or even seen any supporting documentation from you if you only have a pre-qualification letter! An all cash buyer will need to provide proof of funds for the full purchase price, closing costs as well as post-closing liquidity. A buyer who is financing will need to provide proof of funds for the down payment, closing costs and any post-closing liquidity requirements imposed by the building. All listing agents in NYC will require a buyer to complete a REBNY Financial Statement. This statement is a simplified personal balance sheet which asks you to identify your assets and liabilities as well as your monthly income and expense profile. The statement also asks you to itemize and list your schedules of cash, stocks, bonds, real estate, other assets, notes payable, mortgages payable, other liabilities and other income. Co-op listing agents will especially need and ask for this information in order to help screen out buyers who may not pass the financial requirements of the board. These requirements may include considerations such as a targeted monthly debt to income ratio and/or post-closing liquidity target. A purchaser bio is completely optional but highly recommended if you have time. Amongst a competitive field of other bidders, you can help differentiate yourself by writing a short two-paragraph purchaser biography. The biography should ideally include one paragraph about yourself as well as another about your home search and how this particular unit is the right fit. Although you may reach a deal with a seller (offer accepted status), nothing is finalized until a purchase contract is signed. A listing agent is required to relay all offers to his her seller, even if they arrive after the seller has agreed to do a deal with you. Therefore, once you have a deal structured you want to move forward with due diligence and contract execution as quickly as possible to prevent another bid from beating you. One way to do this is to have spoken with and identified a real estate lawyer to work with very early on in the process. That way, you can simply include your lawyer’s contact information along with your initial offer submission. In addition to speeding up the process, having a lawyer lined up also conveys an additional degree of seriousness to the listing agent and the seller. The exact offer submission procedure for the condo or co-op you are submitting an offer on will vary depending on the process followed by the listing agent. While some agents will require the submission of the REBNY offer form (along with supporting documentation), other listing agents will simply request an emailed offer letter from your buyer’s agent. Rent How Long? Rent How Long?